I accidentally picked up my memento ink when inking the stamp, instead of my versafine onyx. And I didn't notice until after stamping it, and didn't want to start over again. (The background was already done and it was my second try for that already :-)) I find versafine onyx works much better with solid type of stamps, as these branches are. I tried to color the fruits of the branch white, but it didn't show up as well as I hoped it would using a white pitt marker. Maybe I'll go over them again with white acrylic paint. The background was made by first masking off the bottom portion using torn paper. I then flicked some masking fluid onto the background using a paint brush. Then inked using distress ink and an ink applicator. Rubbed off the dried masking fluid using a paper towel, removed the mask and then stamped the image. By the way, this stamp along with the sentiment set I used here are both available in my Stamp shop brand new, in case you're interested. They are from the recent Holiday release. Hope you're enjoying your weekend! It's gotten chilly over here, but at least the sun is shining, which makes the beautiful Fall colors even more beautiful. Maybe I'll get my family to take a walk by the lake later today (once hubby comes home from work), to see the beautiful Fall reflections in the water. Such a beautiful card! I really love the background you created! You can almost feel the snow coming down it looks so realistic! Thanks for joining us this week for the weekly challenge at QKR Stampede! Wow...what a fantastic card! You really did a great job on this...love everything about it! Thanks for joining Fun~day Friday at Jo's Scrap Shack. Beautiful Christmas card. Thank you for joining our challenge at ABC Christmas Challenge and we would love to see you again soon. beautiful! i love the colours and the techniques you've used! What a gorgeous card! I love the background, such pretty colors. Love the texture~ Thanks so much for joining us this week in our Funday Friday challenge at Jo's Scrap Shack! Have a wonderful day!! Oh, how beautiful! You did a fabulous job on this. I like Versafine Onyx Black, too, for how crisp and black it is, but your Memento looks just perfect. 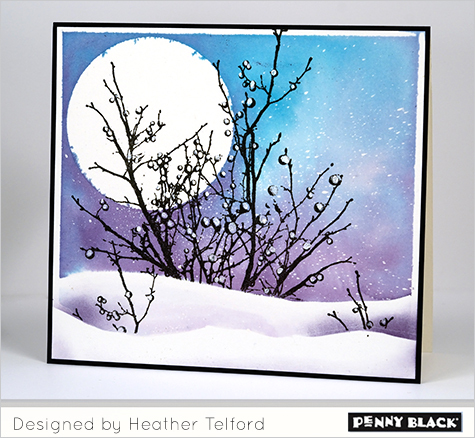 An absolutely lovely card and it's so nice to see it in our QKR Stampede challenge. Thanks for entering our Christmas Challenge here at C.R.A.F.T. !